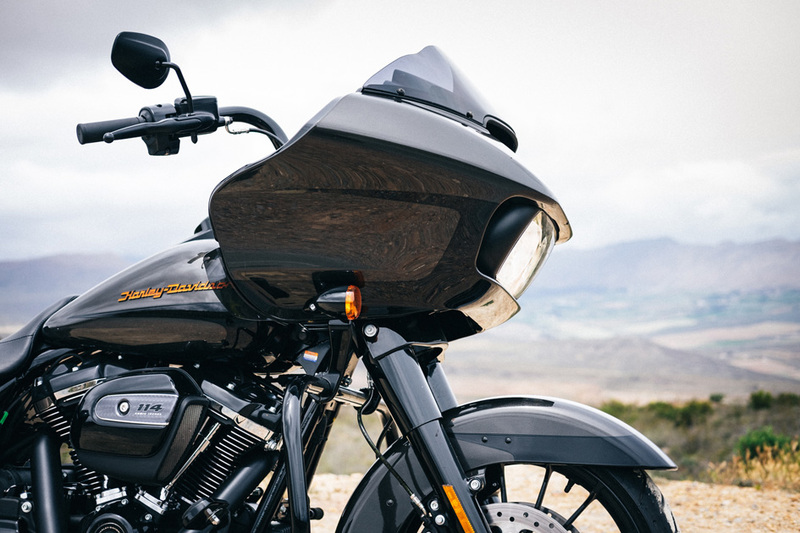 Harley-Davidson’s future looks…interesting. The Motor Co. is on a mission to expand their portfolio, with motorcycles as diverse as the electric Livewire, and adventure-touring Pan America, on the way. That’s left some die-hard Harley fans vexed; worried that the brand will stray too far from its roots. 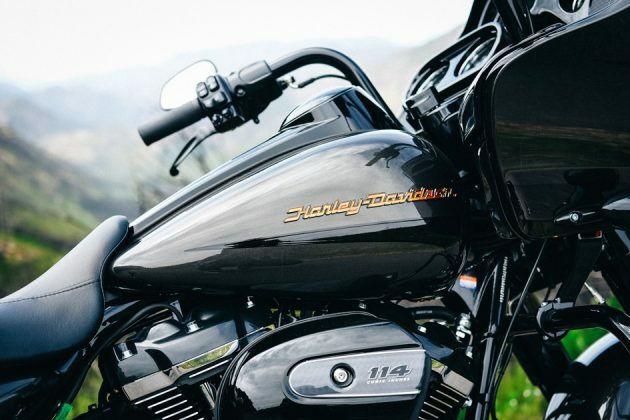 They shouldn’t fret though—because while H-D are certainly trying hard to reach a wider audience, they’re also quietly refining their core bikes in the background. 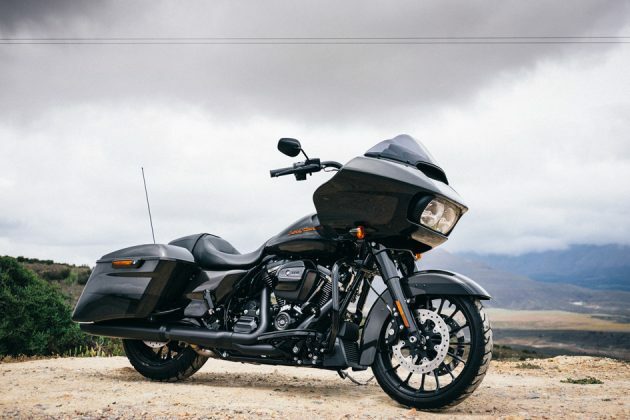 Just look at the 2019 Harley-Davidson Road Glide Special. 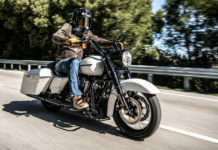 It’s a mainstay of the Milwaukee marque’s line-up—and while it might not be a groundbreaking new model, it’s had some pretty sweet improvements. 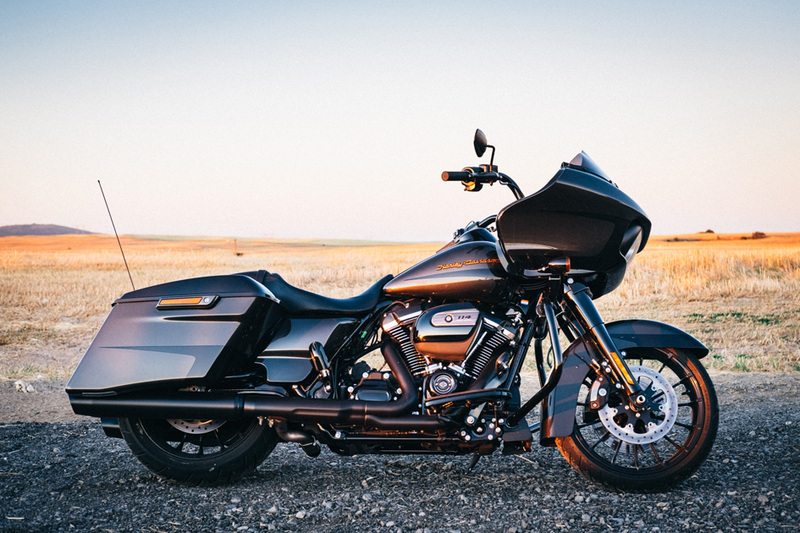 The most obvious difference is the finish: while the standard Glide is loaded with chrome, the Special looks far more menacing with almost-all-black components. My test unit came in the Silver Flux / Black Fuse colour scheme, which consists of a sublime deep silver flake paint job, with black scallops. The Special also gets better-looking wheels, and stretched cases that offer a little more storage. Then there’s its biggest drawcard: the motor. 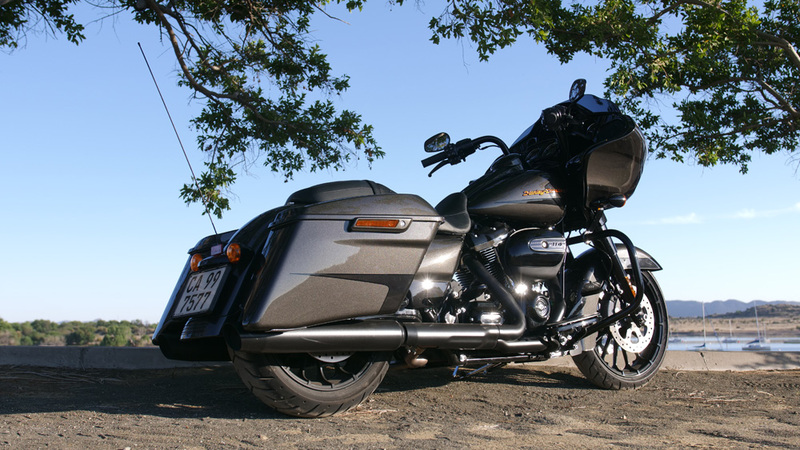 For the past couple of years, both versions of the Road Glide have been powered by Harley’s 107 ci Milwaukee-Eight mill. 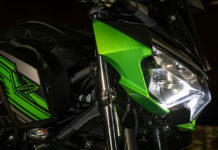 But this year, the Special gets a bump to 114 ci (or 1 868 cc), bringing its torque output up to a mighty 163 Nm at 3,000 RPM. 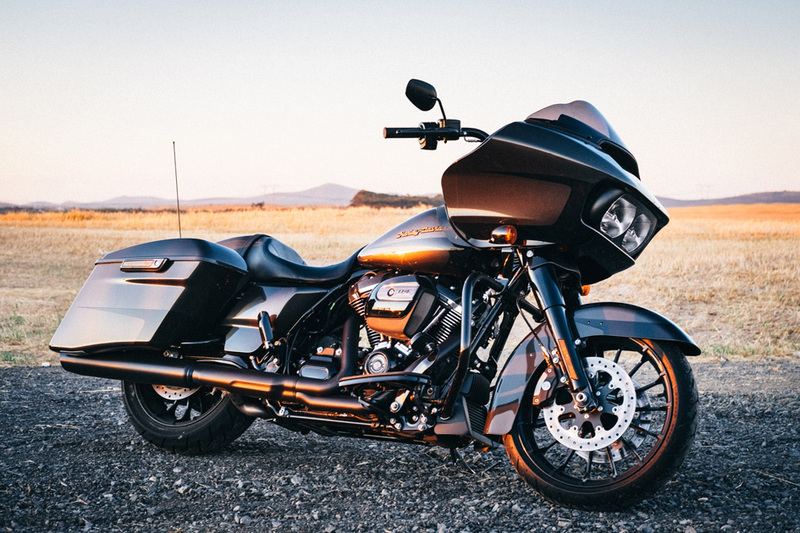 I’m an unapologetically huge fan of Milwaukee-Eight power plant—and the 114 derivative in the Road Glide Special is downright rowdy. 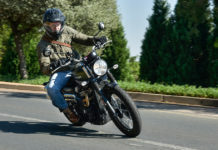 It pulls hard through the rev range, and has no problem propelling the Special’s considerable heft (391 kg, wet) forward. 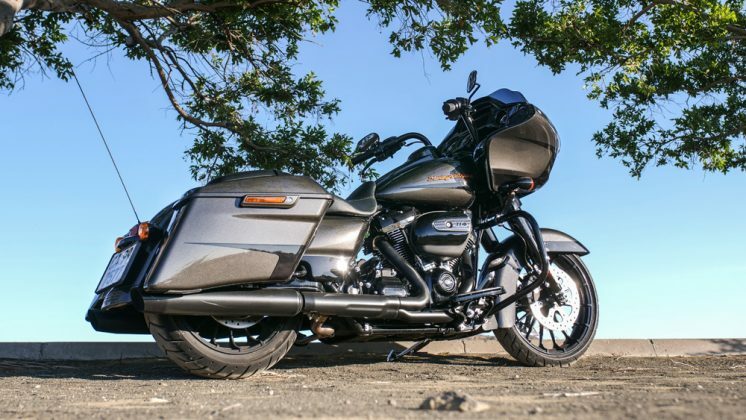 The throttle feels smooth and responsive without being clinical, and even though the Glide’s clutch needs a heavy hand, actual gear shifts through the six-speed box are slick. 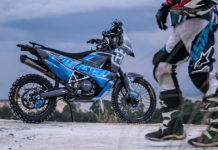 With the Special’s price tag—and considering we’re almost in 2019—I feel like I’m supposed to complain about the lack of techy features, like switchable riding modes. But I’m not sure I want to; the Glide is plenty usable (and fun) without them. 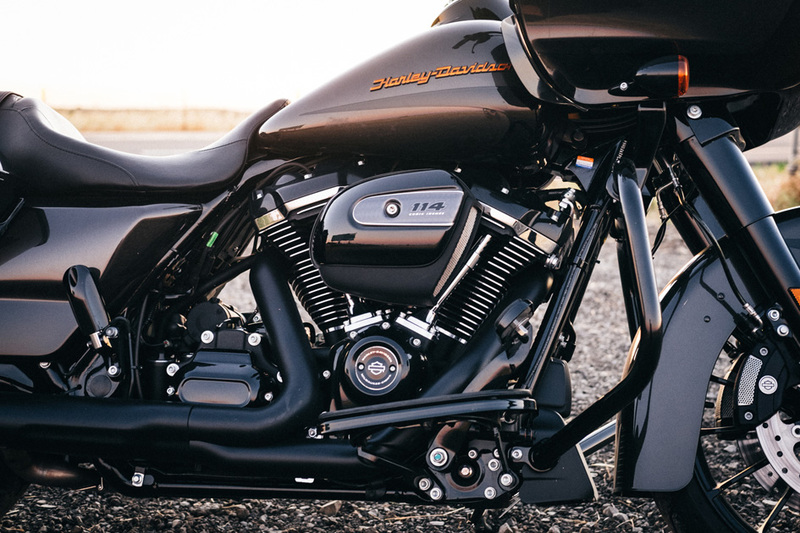 And Harley-Davidson have already announced traction control, linked braking and a few other features for next year, so that extra refinement is just around the corner. 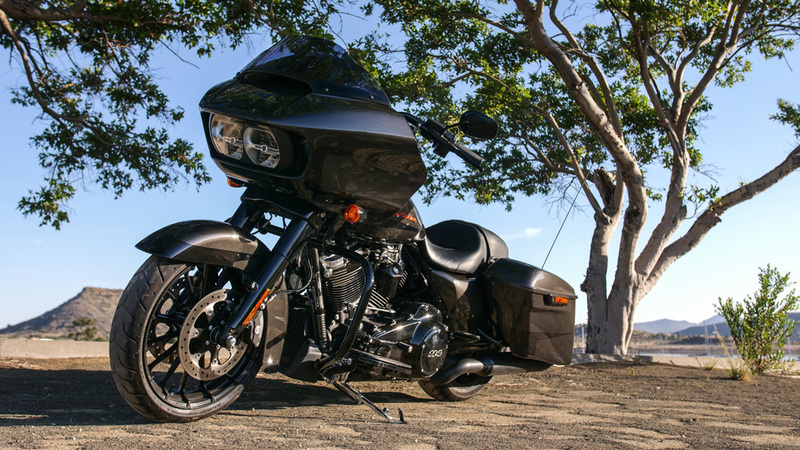 The Road Glide Special’s grunty V-twin is matched by a surprisingly agile chassis. 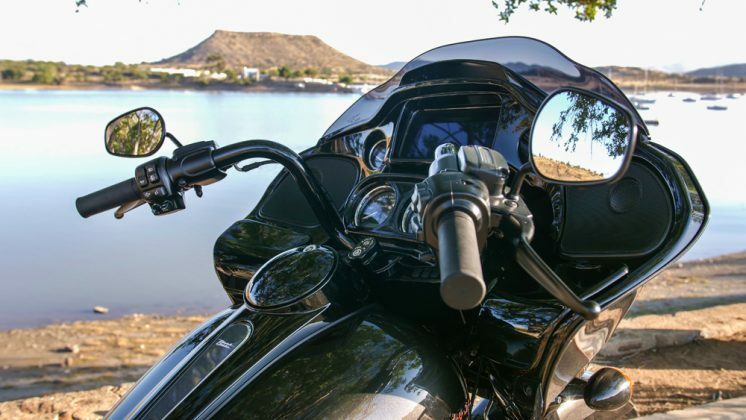 On the open road, it holds its line like a cruise liner in quiet waters. And despite its touring designation, it loves spirited riding too. 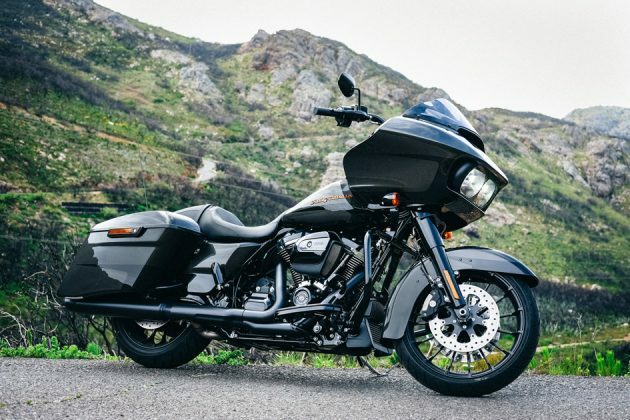 Few things are as fun as manhandling a bagger through twisties, and while the Special doesn’t quite hustle through turns like a sport bike, it sure holds its own. With a 19” front and 18” rear wheel (versus the standard Glide’s 16” rear) it feels more balanced too, with an extra degree of lean on each side. 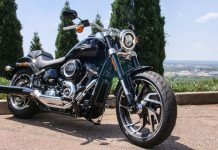 Getting the floorboards to touch tarmac was near impossible, no matter how hard I flung the Harley’s high and wide handlebars around. 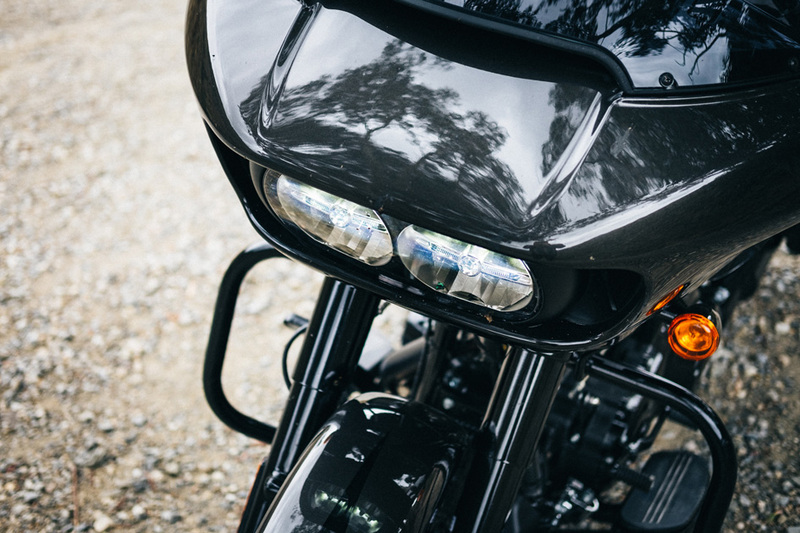 With ABS and twin discs up front, it’s easy to slow it down too—but I did notice the front brakes get a little wooden as they heated up. I had limited time with the Road Glide Special, but somehow managed to squeeze out more mileage in a few days, than I normally manage in a week of testing. 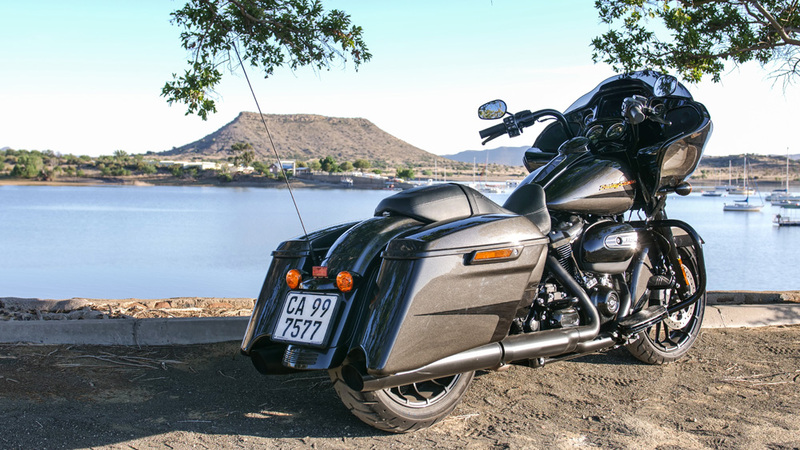 It included a rapid 400-plus kilometre ride to Montagu for lunch one Friday, where the Special’s all-day comfort shone through. 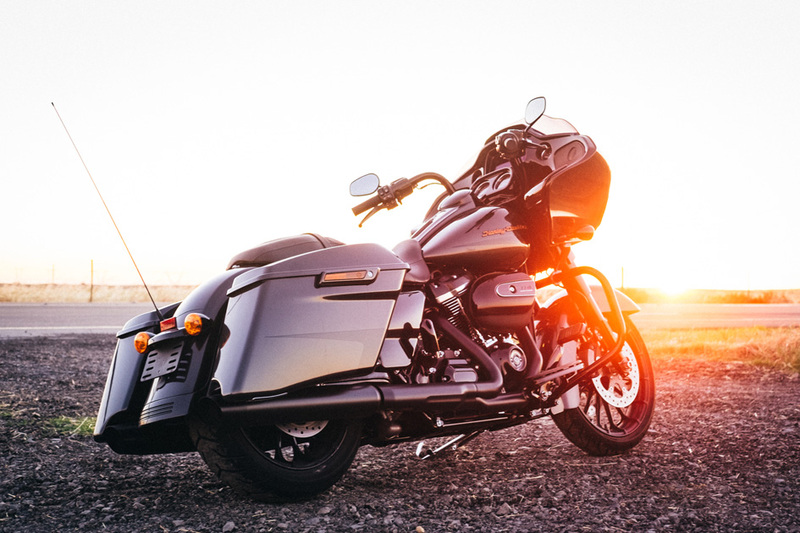 The ergonomics are just about flawless—with a wide, cushy seat, and well-placed handlebars and floorboards. My only niggle was the positioning of the dual toe-and-heel gear shifter, in relation to the left floorboard. My size 12 foot didn’t quite sit right in between them—a problem that could easily be fixed with some basic adjustability. 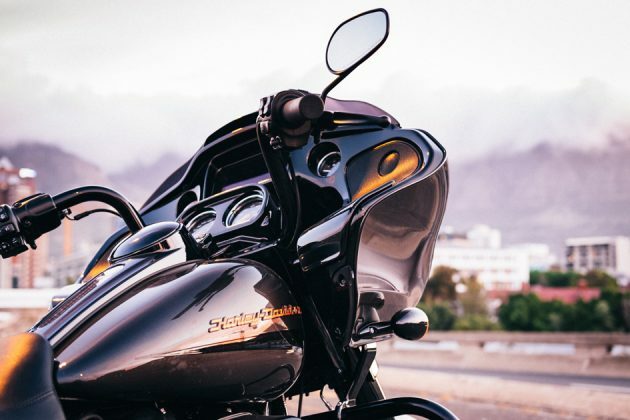 The Road Glide’s fixed fairing is stable at speed, but if you’re as tall as me (1,86 m), the sleek windscreen won’t block all the wind. 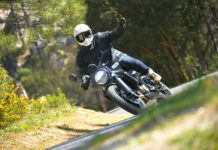 With the right helmet on, the buffeting isn’t too bad—but taller riders might consider fitting something more substantial. 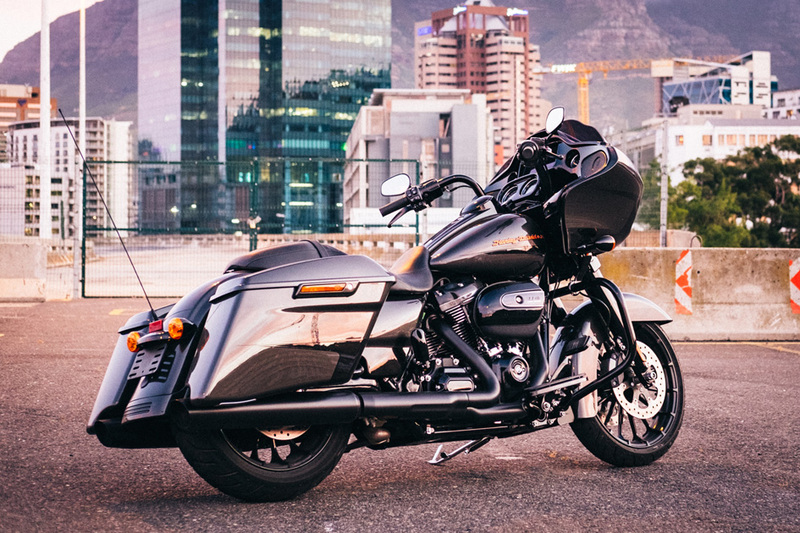 Behind the fairing, you’ll find a classy mix of old and new school styling. The Road Glide’s kitted with analogue speedo, tacho, temperature and fuel gauges, but it’s also sporting Harley-Davidson’s new Boom! Box GTS media system. 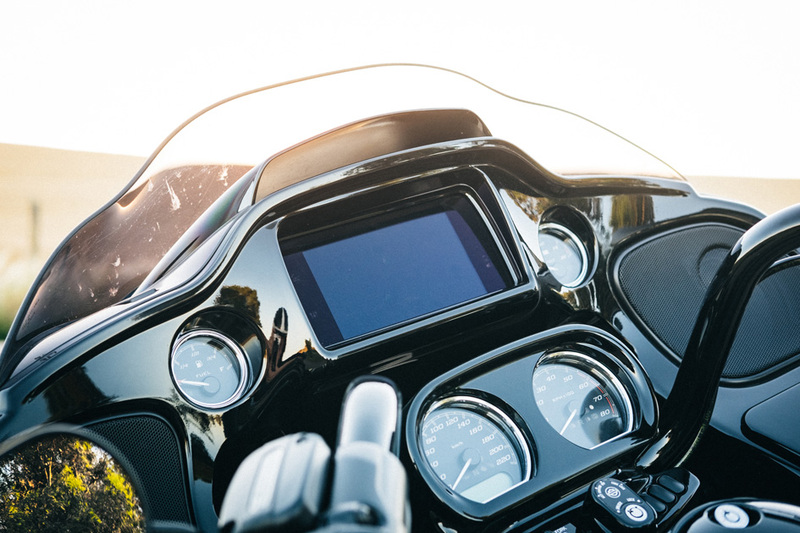 There’s a full colour TFT touch screen display front and centre, flanked by a pair of 6.5” speakers (the regular Glide gets 5.25” units). 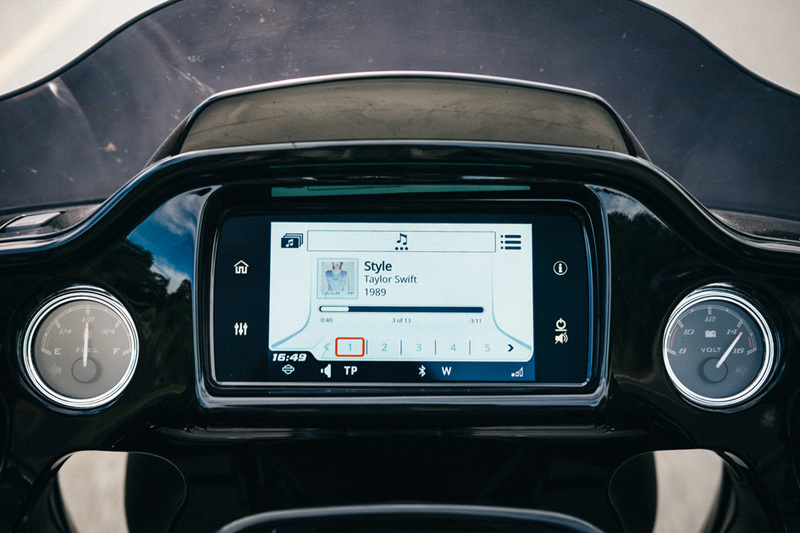 The system is Bluetooth capable, and includes everything from onboard navigation to a media player. The system honestly has more features than I had time to explore—like voice recognition, and the ability to link up your in-helmet comms system. I simply paired up my iPhone, and found myself flicking through my favourite tracks in no time. 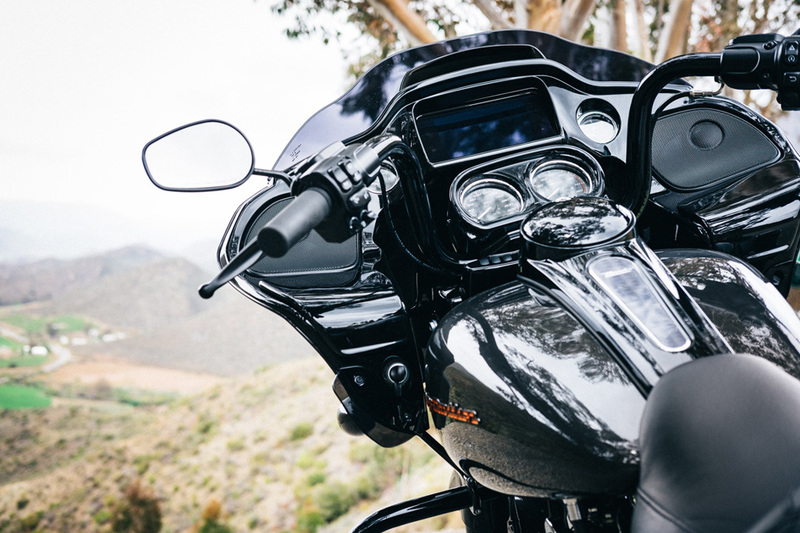 The system’s touch screen works just fine with gloves on, and the handlebar-mounted buttons are both intuitive and effective. (I just couldn’t figure out how to pause and restart a song, but I’m sure I was just being daft.) There’s even a USB port in one of the fairing’s handy cubby-holes—I used it to charge my phone, but you can also use it to plug in a USB drive. 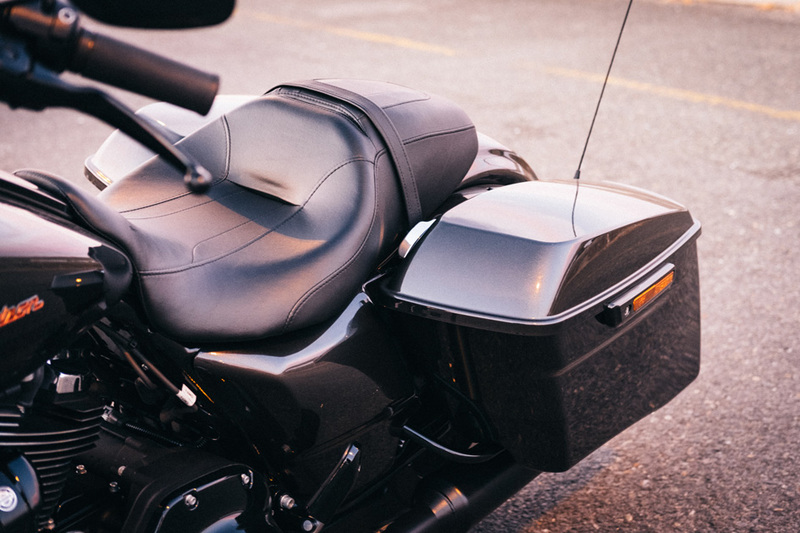 Audio quality is relatively crisp for a bike-mounted system, but the speakers run out of presence at speeds over 100 km/h. 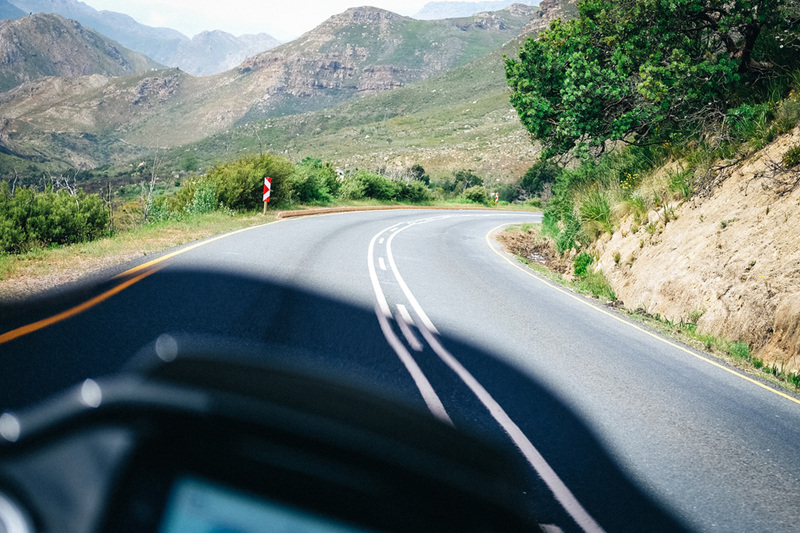 There’s also an auto-volume option that dips or raises the volume depending on your speed, so that you don’t have to be ‘that’ guy at the traffic lights. I gave the navigation a whirl too, and found it to be a huge improvement over Harley’s previous offerings. I’d love more time to fiddle with the Boom! 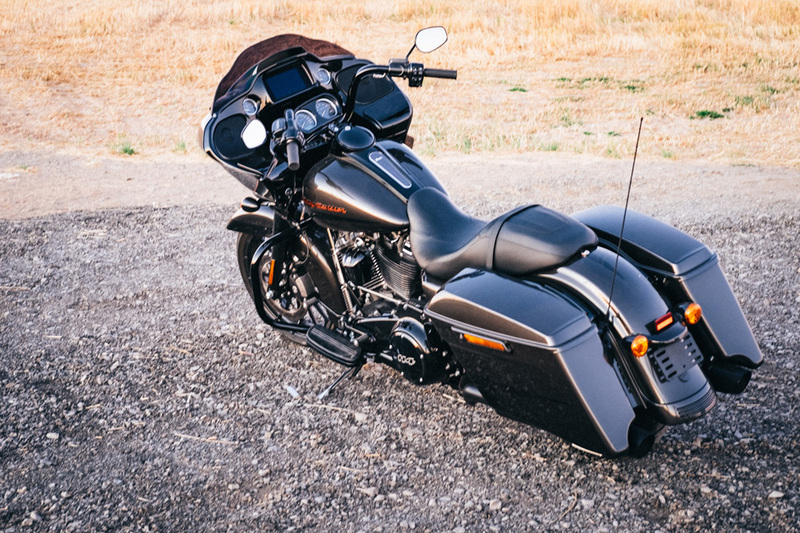 Box GTS setup, but it does highlight one of the Road Glide Special’s strengths: creature comforts. 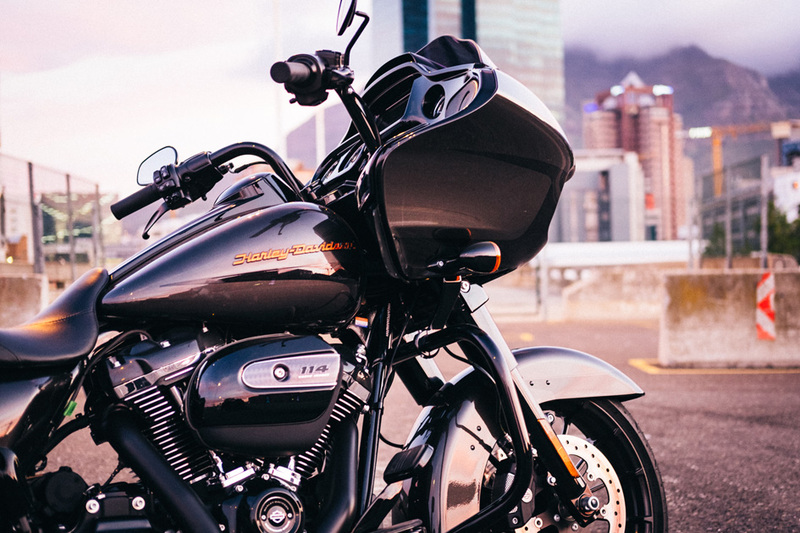 Not only is it plush enough to spend hours on on, but it’s also loaded with 71 litres of storage, thanks to the lockable side-cases. 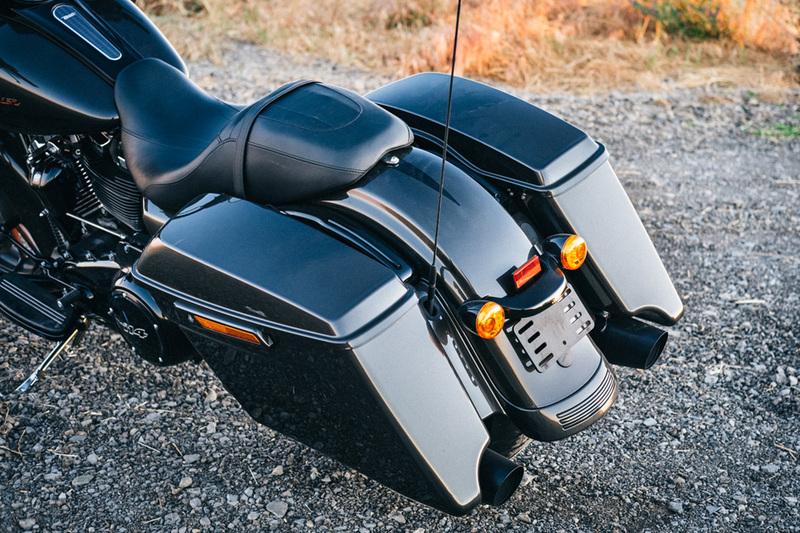 Between those, and the fairing’s little cubbies, there’s no need to stuff your pockets or carry a backpack. And with a well-engineered cruise control system in the mix, you’re not likely to get tired soon. Add a passenger though, and you’ll need to upgrade a few bits. 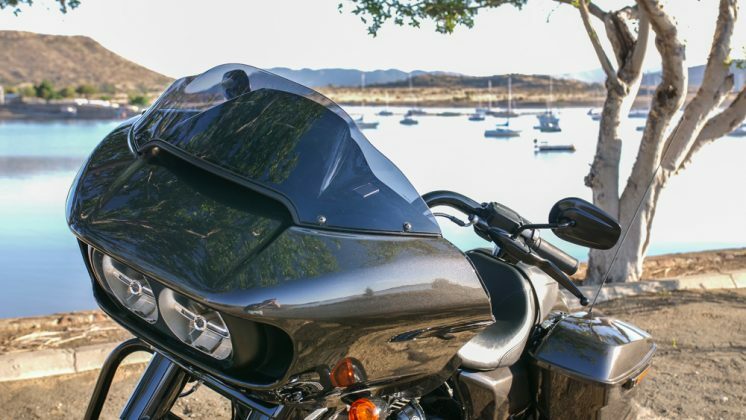 The pillion seat is slim, and tapers off towards the back—so you’ll want a sissy bar at the very least, or a new seat with a padded top box for the ultimate two-up setup. That doesn’t stop the Road Glide Special from being one of the raddest motorcycles I’ve ridden recently. 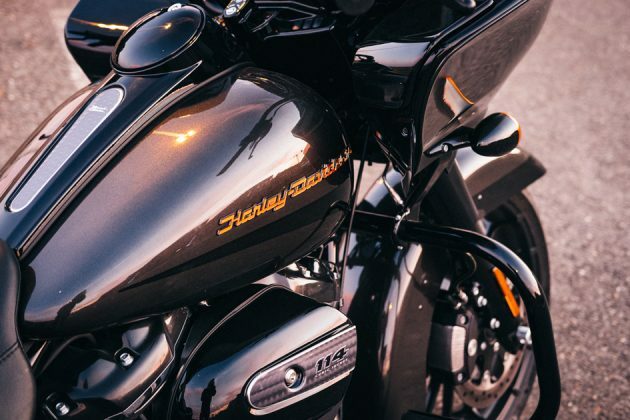 I wouldn’t pick it for day-to-day riding—especially in tight traffic, where it’s just too unwieldy. 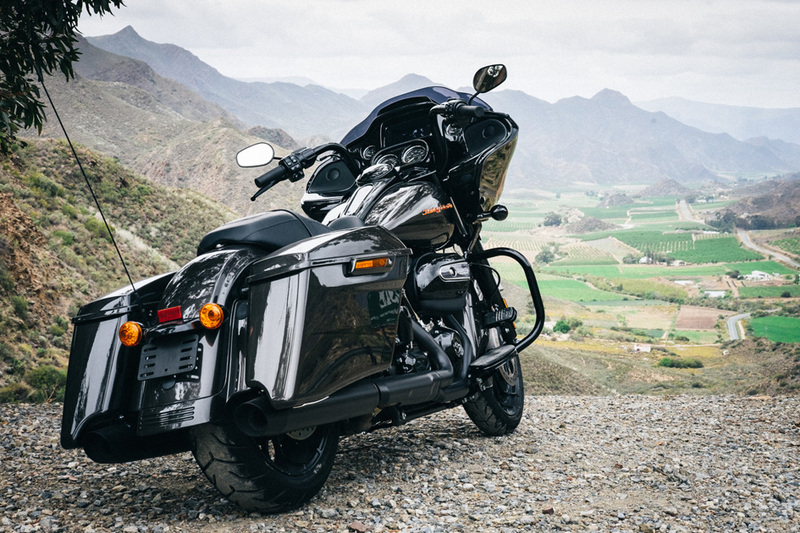 But between devouring miles on the open road, and hooning through my favourite mountain passes, the Special has me hooked on #BaggerLife. 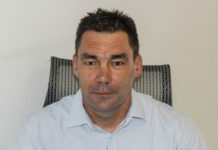 By Simon Morton – Online Editor at ZA Bikers. 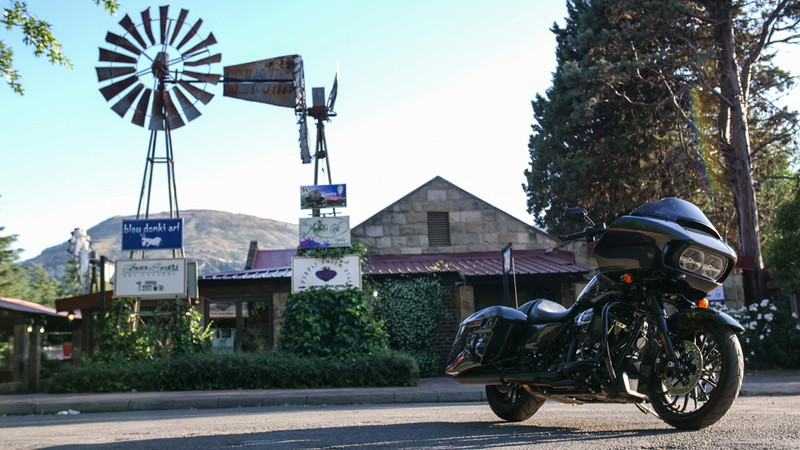 I have just come back from a 3 day extended trip in which I rode the Harley-Davidson Road Glide Special for a full 1500 km. 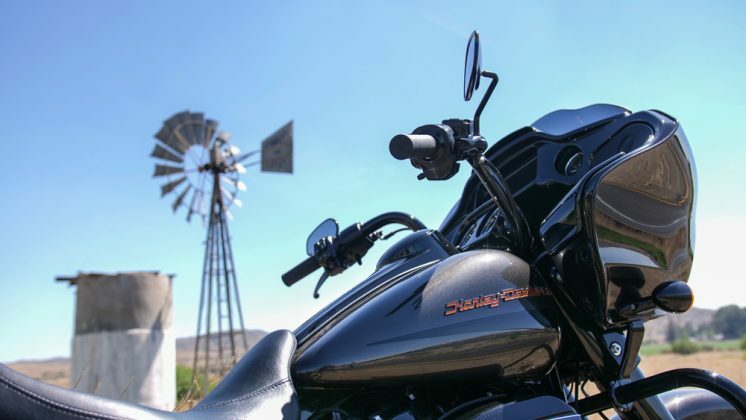 On the first day I rode approx 700 km from Pretoria down to Gariep Dam in the Southern Freestate. 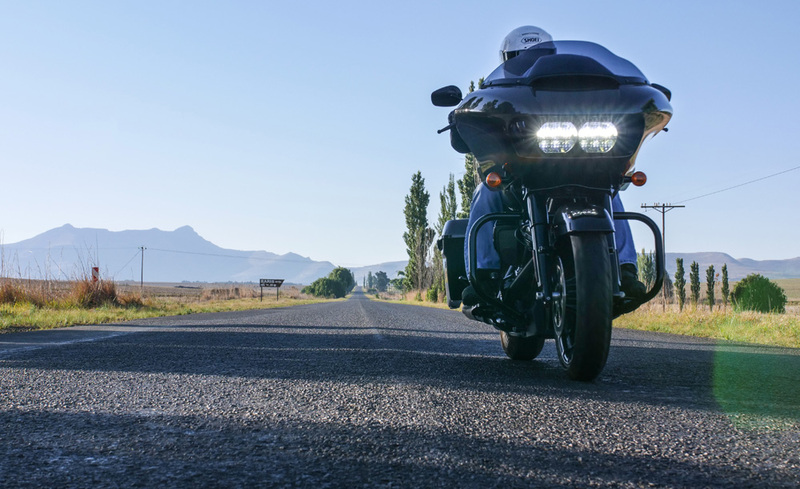 Riding the N1 highway was superb – the Glide is such an extremely comfortable bike and with the added benefit of an on-board infotainment system, 700 kays in a day was a doddle. Like Wes, I also had a small issue with the dual toe-and-heel gear shifter but mine was a bit different. 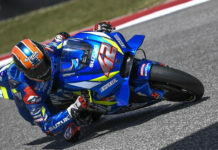 I found that whilst trying to sit more upright, during long stints on the bike, I was not able to slide both feet back on the footrests due to the heel gear shifter being in the way. 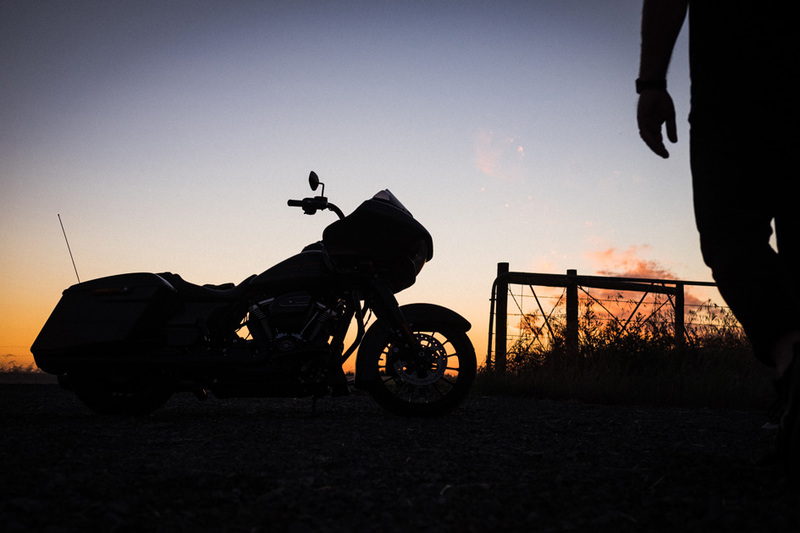 Instead, I found relief by resting my feet on the rear pegs. I was able to pack all that I needed for my trip easily into the bike’s panniers, and having my cell-phone on permanent charge gave me peace of mind that I would not get stuck on-route, without any communications. 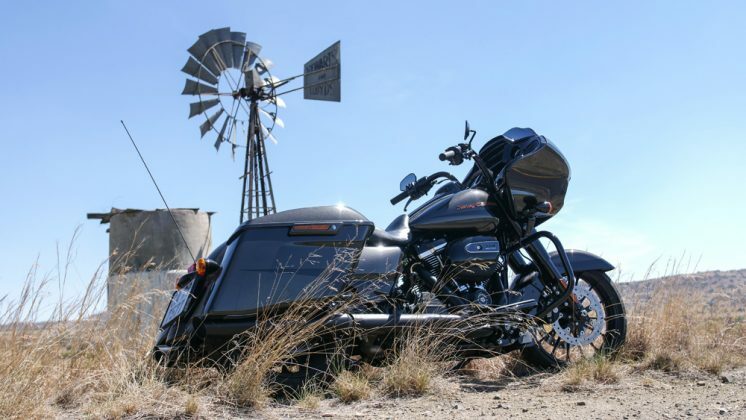 The Glide’s 114 ci motor is truly sublime! Nothing beats hurtling along through some of South Africa’s finest vistas, listening to the sound of a throaty V-twin backing track. 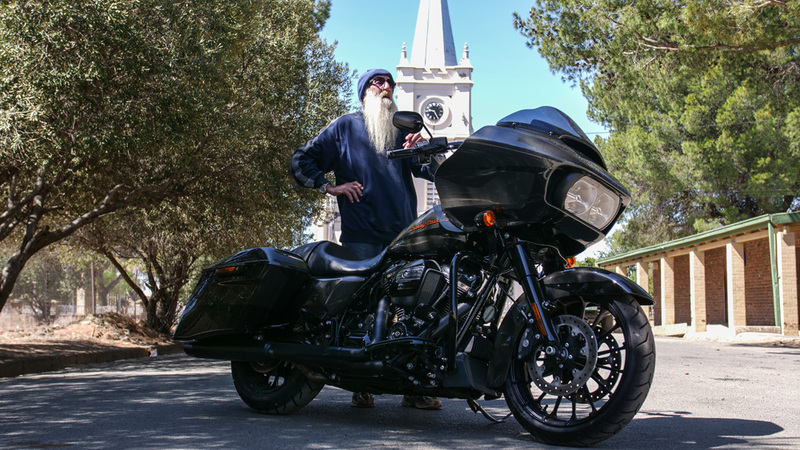 Everywhere I stopped bystanders would flock to admire the Glide and to take selfies. 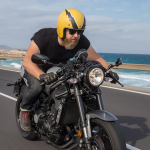 I really enjoyed the status factor when riding this beast – this is such a badass bike!! 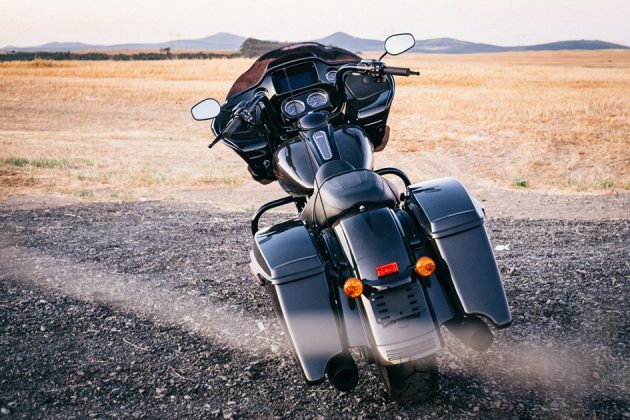 My only real dislike was when traversing through very bumpy and pothole stricken roads, in this scenario the Glide was a real handful to navigate. 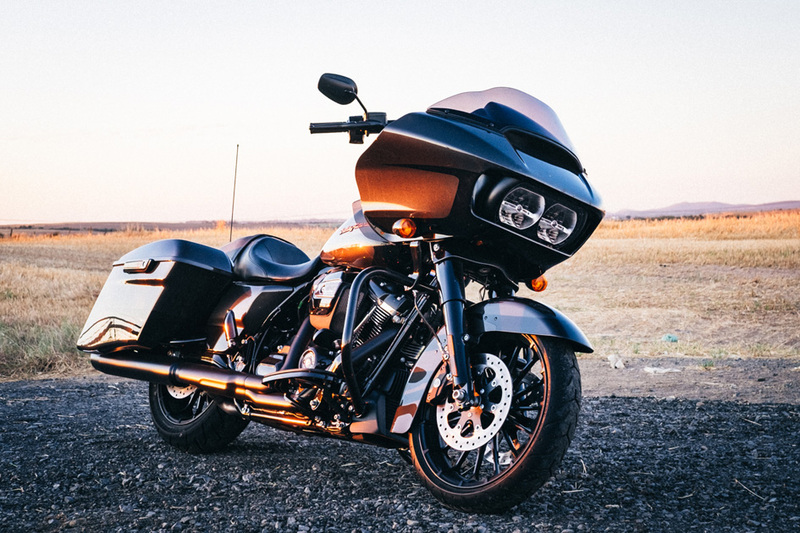 Overall I had such an amazing experience, riding a Harley-Davidson of this calibre on good roads is pure motorcycling bliss – a real mile eater for sure! 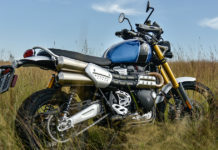 Previous articleDunlop hits back in the Adventure Bike Segment!